Places We Call Home: Hackensack, N.J. The name Hackensack only became the official moniker in 1921. Billed as A City in Motion, Hackensack has been on the move since before the founding of the United States. 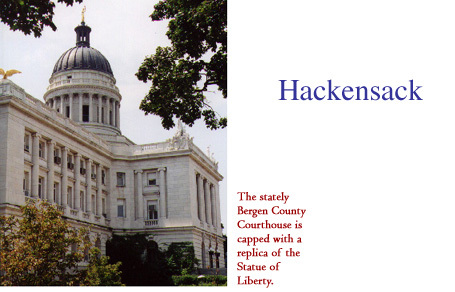 In 1709, the city became the Bergen County capital; and, to this day, the hub of Hackensack is the Bergen County Courthouse, a massive domed structure topped with a replica of the Statue of Liberty. Business that revolves around the courthouse causes the population to triple during workdays and lends an official air to Hackensack. Actually, the name Hackensack only became the official moniker in 1921. When Dutch and French settlers arrived in 1664, they decided against the original Indian name, Hacquinsacq, and instead called the region New Barbadoes. But the old roots were hard to ignore. Pride in the past also accompanied the revitalization of Main Street, decorated with reddish cobblestones and quaint wrought-iron benches. The downtown area is enhanced by the Dutch Reformed Church, the second oldest church in New Jersey, which sits across from the courthouse. Its high steeple stands guard over the bordering cemetery where Enoch Poor, one of George Washingtons officers, is buried. Nearby is General Poors Tavern, an old-fashioned public meeting place. This mixture of the old and the new is typical of Hackensack, where the median age is 35 years and young families and older residents alike have always pulled together. In its early days, the townspeople created the first county high school, the Hackensack Hospital, the Johnson Free Public Library and The Evening Record, soon after setting up fire and police departments, electricity and telephone and water services  all in a 30-year span (1871 to 1901). Hackensack has often been equated with excellence, and nowhere is that more evident than at Hackensack University Medical Center. But the city in motion also knows how to relax, as is evident by nine municipal parks. Hackensacks parks each claim a personal and traditional identity. For example, Independence Day festivities are tied to Foschini Park, while Columbus Day celebrations are naturally held at Columbus Park. Hackensack has often been equated with excellence, and nowhere is that more evident than at Hackensack University Medical Center. Founded in 1888 as the countys first hospital, it has grown to become New Jerseys largest health care provider and the seventh largest health care provider in the nation. Bergen Countys largest employer, the center has earned the prestigious Magnet Award for nursing excellence four times  an honor shared with only one other hospital in the nation. FDUs Henry P. Becton School of Nursing and Allied Health is affiliated with the center, and students gain vital clinical training there. Hackensacks urban benefits and small-town atmosphere offer FDU students the best of both worlds. With a footbridge spanning a narrow part of the Hackensack River, the University expanded its Teaneck campus, and today Hackensack is home to Dickinson Hall, the Edward Williams Building and the George and Phyllis Rothman Center. Though located in a thriving city, the University along the river maintains a suburban appearance. Carpeted between buildings are stretches of buttercups and clover and a wide variety of unusual trees enduring from the 1940s, when Peter Henderson, the Seed Man, planted the banks with trees for the many birds in the area. As a result, birds are a significant part of the campus, especially the geese that raise flocks of fluffy goslings each spring. For those who want even more motion than Hackensack, New York City is just a 20-minute drive or a bus ride away  a tremendous advantage to students and faculty alike. But advantages for students are even closer, and each visit to Hackensack proves just that.